Indiana’s Building Trades Unions are the single-largest provider of skilled construction professionals to Indiana’s construction contractors. As Indiana’s largest vendor of construction labor, they work with our signatory contractors to supply a highly trained workforce that is driven to pursue quality, productivity and safety. In Indiana, the industry invests over $42 million dollars a year in apprenticeship and journeymen-upgrade training to meet the needs of their contractors and construction users. Through their apprenticeship programs, at any given time, Indiana’s Building Trades Unions are training 6,000 to 7,000 apprentices for careers in the Building and Construction Trades. Their members receive both classroom and on-the-job training at no cost to the members/apprentices, while earning progressive scales of wages. Upon completion of their apprenticeship, most apprentices receive both their certification as a journeyperson and an associate’s degree in construction technology. 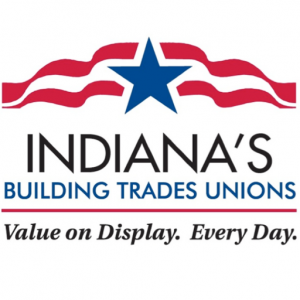 The Indiana Building Trades Unions consist of the following international unions: Boilermakers, Bricklayers and Tile Setters, Carpenters and Millwrights, Electricians, Elevator Constructors, Insulators, Iron Workers, Laborers, Operating Engineers, Painters and Glaziers, Plasterers and Cement Masons, Roofers, Pipe Trades, Sheet Metal Workers and Teamsters.